This spring has been a nice, gradual transition from deep snow to soft muddy soil. 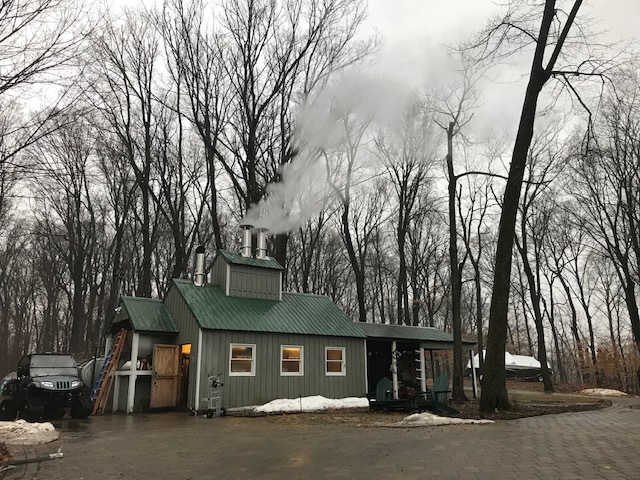 Our first boil was Friday, March 22nd. Since then, we have boiled seven times, never more than three days apart. So it has been a nice consistent sap run this entire time. We have made 429 gallons of finished syrup so far, all of it classified as Amber Rich or Dark Robust. We haven't made any Golden Delicate or Very Dark syrup yet. So far everything with the new evaporator has been going well. We set two single day production records, first 92 gallons then 97 gallons on Saturday, April 6th. We learned from the first big boil that we need to switch out the syrup pans more frequently than 92 gallons--we had some baked on sugar sand that took some elbow grease to remove! But with the new propane evaporator, switching pans is very easy. We can shut off the gas and the arch is cool enough to remove the near syrup concentrate within 15 minutes--perhaps even sooner than that. This is a big change from the wood evaporator that took a very long time to cool down because of all of the fire brick that held onto heat even after the coals were gone. Looking ahead we still expect to make quite a bit more syrup. With today as a warm exception (it is currently 61 degrees as I type this), we still have several hard freezes in the forecast through the weekend so we can anticipate sap flows at least through next week. The buds on the trees haven't even started to change, the sap is still clear, the frost is in the ground, the ice is just leaving the lake and apparently a blizzard is going to hit on Wednesday into Thursday. The calendar might look like it is getting close to the end of the season, but our local environment feels like we still have some mapling time ahead!